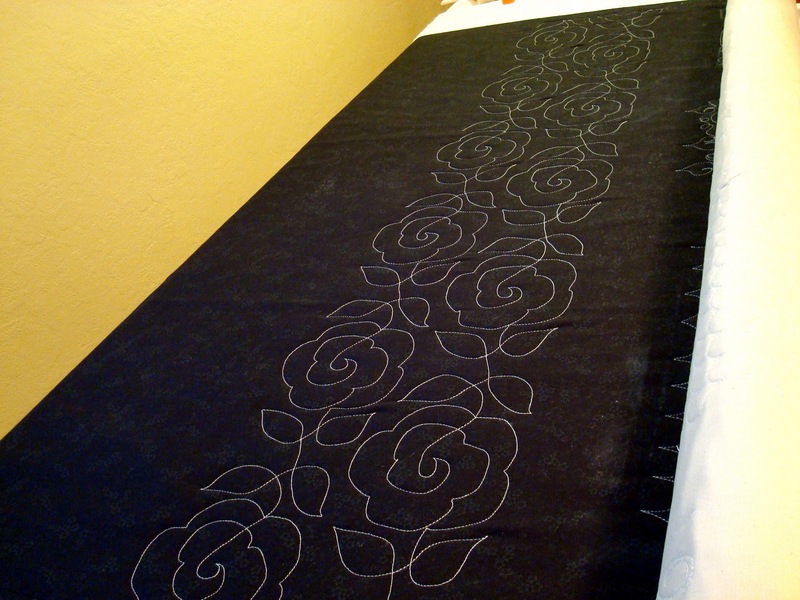 Squash House Quilts: Solo Supreme Peek! How fun to do try out a solo project! Looks really cool like all of Stephanie's designs! Panto looks great, Candace. You did a beautiful job. Yes try a quilt. It's great practice because it's so different from muslin! You'll do a beautiful job! You're awesome! Can't wait for you to reveal the entire project...well both projects. :o) WOW, your roses are so professional looking. Can't wait to see your quilting on "the real thing." Making Stephanie's prototypes would be great fun but the most awesome thing about knowing her is that you have probably met Abby - that would be the best ! Love the floral fabric - can you share the name of the line ? So that is your new love..."Vinnie", looks like you are doing a wonderful job already. Ooh, I'm looking forward to this new pattern from Stephanie. I HEART her bag patterns. She has such a gift. Hugs to you and Mr. Squash. 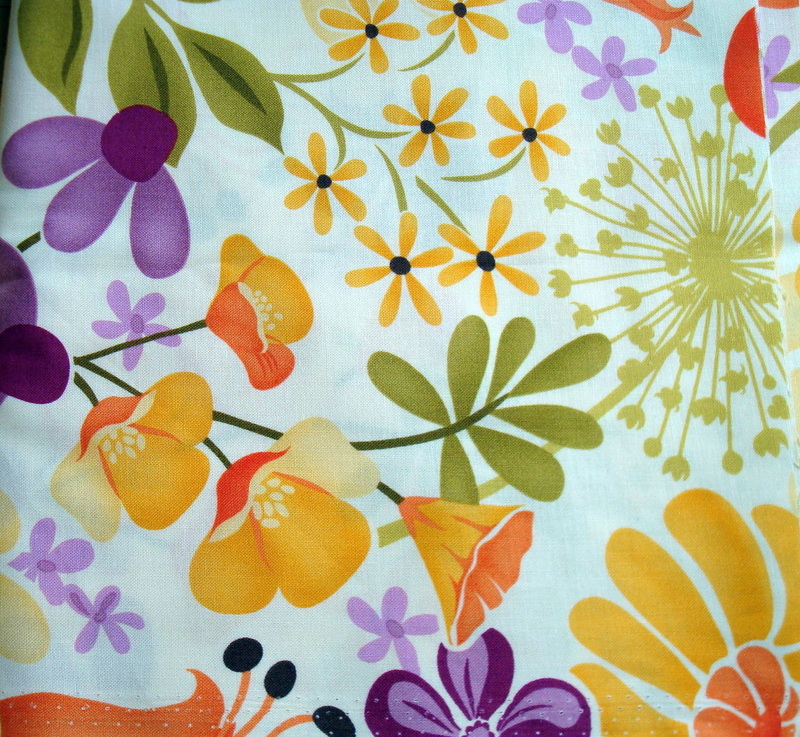 The sneek peeks look promising and your fabrics are very pretty. You have made great progress with Vinnie! Weell, you have to start somewhere so put Baby Roses on Vinnie. Great sneak peek of the pattern from Stephanie and your fabric. So pretty. By now...bet your tired of playing on boring fabric! I say GO FOR IT! Candace...you are ready!!! You did a great job with your panto. It's time for you and Vinnie to do a real quilt - go for it. teehee!!! Well, just look at you go! Great job. I'm very curious about that velveteen! How fun to have a solo. Gotta take that leap sometime! I think you're ready!! It sounds like it's going to be fun for you to be a Supreme! Nice job on Vinnie. I think you should totally go for it!!! At some point, it is time to just do it! I say go for it! What can it hurt? No time like the present. You can always rip it out. Ask me how I know! LOL! Already your quilting is better than mine. You ought to see my poor feathers I am currently doing. What was I thinking? But those suckers are staying in. Your practice looks great, but I do understand questioning whether it is time for a real quilt. You will know when you are ready. Have a great week! Go for it. All of us in blog land know you are ready! You're a natural. It's time to bite the bullet and put a real quilt on the frame. I love the panto, it looks wonderrful. I think sometimes we can just keep practicing for too long and then be afraid to put a real quilt on. I would say go for it. I look forward to see the actual pattern Stephanie designed and you worked out! So different, so much fun! 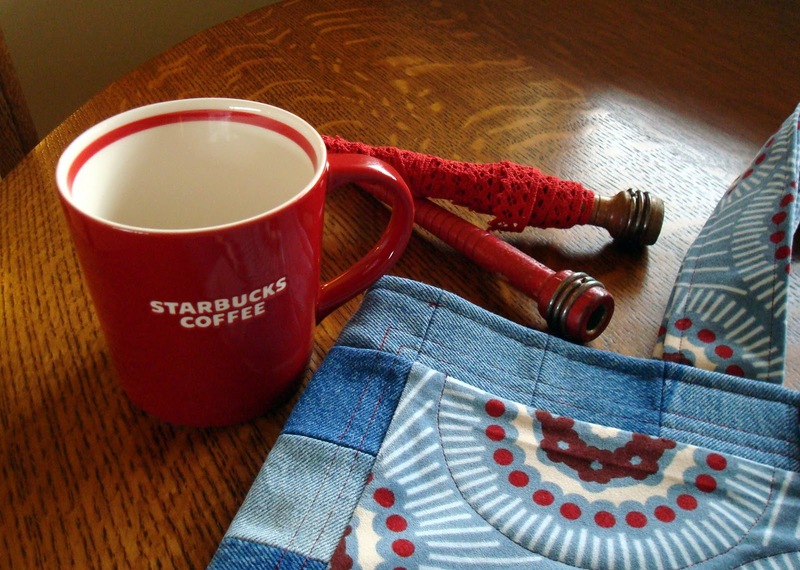 Love the red mug and spools! You rock the panto! Might be time to load up a quilt top and see what kind of magic happens. I'll be waiting to see the results. :-D Hmm...wonder what Stephanie has up her sleeve now?